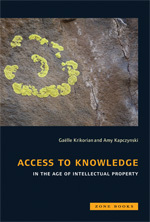 I just wrote a short contribution to an online symposium held by legal blog Concurring Opinions to celebrate the publication of Gaëlle Krikorian and Amy Kapczynski’s book, Access to Knowledge in the Age of Intellectual Property. A2K is an interesting rallying point for folks working globally on a variety of issues related to intellectual property and/or the politics of copying today and the collection gives a broad and generous overview of the topic. I particularly recommend Amy Kapczynksi’s introduction, Yochai Benkler’s overview of A2K and information commons, and the essays by Lawrence Liang, which were a revelation to me. A2K resonates in a very clear way with recent events such as the shut down of the Internet during the Egyptian unrest, and WikiLeaks’ appropriation and dissemination of national archives and databases. It’s part of a shift in IP research towards thinking about IP as a human rights issue. You can download the whole book chapter by chapter for free from the MIT website.